Upon arrival at Kathmandu airport you will be met and transferred to your hotel of choice. The rest of the day is free for you to explore the local area. After a pre-tour briefing we head into the centre of Kathmandu for a tour of the city. We visit Durbar Square, with its numerous temples and the old royal palace, we take a walk up to the top of Swayambunath Stupa for a great view over the city, and of course there is plenty of time to enjoy the numerous shops and stalls along the way. The evening is free for you to continue exploring or sample Kathmandu's unique nightlife. After breakfast we travel from Kathmandu to Jiri by private vehicle. This scenic route passes through beautiful countryside and terraced fields before arriving in Jiri where you will overnight in a lodge. You begin your trekking today with a walk through thick forests and over suspension bridges, taking the trail up to The Mali Damda. From here we descend to Shivalaya and then on to Deurali where we spend the night. Today you will trek towards Sete, heading down Thado Khola via the suspension bridge before continuing through the valley to Kinja and on to Sete. You have a gradual climb today which takes you to the Lamjura Pass (3500m), and your first viewpoint of Everest. We then descend to Junbesi and overnight in the lodge. Leaving Junbesi you follow the trail to Solung. A short decent then takes you to the Ringmo Khola from where you climb up to the Taksindo Pass. You then descend again, this time to Nunthala where we stay overnight. After descending further, you pass the Dudh Koshi river and then ascend through traditional Sherpa villages to Khari Khola. Today there is a chance to spot wildlife, including monkeys, as you trek through the forests towards Puiyan. Leaving Puiyan, the trail climbs to a ridge and then descends to Surke More. Trekking on from here in the direction of Lukla, the trail offers some stunning mountain views before you finally follow the Dudh Khosi to Phakding. Today starts gently as we make our way along the river to the entrance of Sagamartha National Park; this is where we will obtain our trekking permits and register with the park authorities. Soon the trail starts to rise and we begin the long climb up to Namche Bazaar (3,446m), where we stop for the night. You have a free day in Namche Bazaar today, for acclimatisation. This is a colourful Sherpa town and is a great place to spend time exploring. There are plenty of shops and stalls selling everything form cut price trekking gear to Buddhist prayer flags. Its internet cafes, bakeries and cafes are also popular with the many visitors. Of course, if you’re not too tired, there are plenty of interesting and scenic day walks you can do if wish. We overnight at a lodge in Namche Bazaar. We leave Namche Bazaar behind today and climb over a ridge to Khumjung, a picturesque Sherpa village nestled in the next valley. On top of the ridge it is possible to get your first glimpse of Mount Everest, weather permitting. We overnight at a lodge in Khumjung. Today's goal is to reach the village of Thengboche, which lies on top of the next ridge. This means we start the day with a long descent through beautiful Rhododendron forests, down to the suspension bridge at Phunki Tenga (3,250m). We then start the strenuous climb and eventually we crest the ridge and arrive at Thengboche (3,870m), from where, on a clear day, the views of Everest and Lhotse are magnificent. Thengboche is also the site of a large Buddhist monastery, which is certainly worth a visit. We overnight at a lodge in Thengboche. Today’s journey takes us through some beautiful Rhododendron forests as we follow the river up the Imja valley to Dingboche. Whilst on this stretch of the trail there is a good possibility of spotting the elusive musk deer, an endangered species, indigenous to this area. Leaving the forests behind, today ends with a steep climb up to Dingboche (4,410m). We overnight at a lodge in Dinggboche. We spend today in Dingboche acclimatising to the high altitude. This traditional Sherpa village is a patchwork of fields enclosed by stonewalls and offers wonderful views of the surrounding mountains. If you've got plenty of energy and don’t feel like resting you can head up the valley towards Chukung for even better views. We overnight at a lodge in Dingboche. Today we climb up from Dingboche and follow the valley high up on one side until we reach Dughla (4,620m) and the entrance to the Khumbu valley. Heading up the Khumbu valley, a steep climb takes us over the Thokla Pass (4,830m). From here we follow the edge of the glacial moraine onto Lobuche (4,910m). We overnight at a lodge in Lobuche. As we continue through the Khumbu valley the unfolding mountain panoramas are spectacular. After reaching the Lobuche Pass (5,110m) we continue on to Gorak Shep (5,140m). Whilst here we take a welcome break from the altitude before making our short but steep ascent of Kalar Pattar (5,550m). This view point is the perfect place to take in the full majesty of the surrounding mountains. We overnight at a lodge in Gorak Shep. We continue up the edge of the Khumbu glacier today, until we finally reach Everest Base Camp (5,364m). 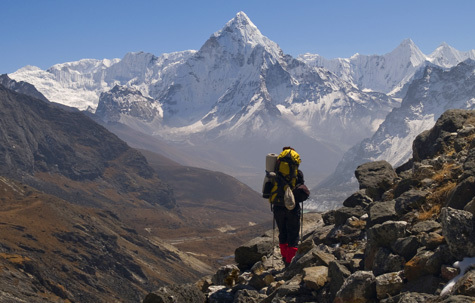 If you’re lucky, you may see expeditions preparing to climb Mount Everest. After spending some time to enjoy the surroundings and the completion of our goal, we make our way back down to Lobuche. We overnight at a lodge in Lobuche. From Lobuche we head back down the trail to Lukla, via Namche Bazaar. Having acclimatised well to the altitude the trekking is much easier as we make our way back down to Lukla. There is plenty of time to take in the beauty of our surroundings. We overnight at a lodges in Namche Bazaar and Lukla. We take a flight back to Kathmandu this morning, from where we make the short transfer to the ancient centre of Bhaktapur. Formerly the capital of one of the Kathmandu Valley's four kingdoms, Bhaktapur is a treasure trove of ancient wooden carved buildings and temples, and is a great place to spend some time exploring and getting a feel for life in Nepal centuries ago. Note. This day is built into the itinerary in case of delays to the flight back from Lukla to Kathmandu, which do occur fairly frequently when the weather is cloudy or there are high winds. You have some free time in Bhaktapur this morning before transferring the short distance back to the centre of Kathmandu. You can relax and take it easy or do some more sightseeing or final shopping, the choice is yours. Options include adding an extension to the tour to Chitwan or Bardia National Parks, or to try some exciting white water rafting.